Two weeks ago, we received an inch of ice at the MHM garden. Because it’s the South, and we have no snow-and-ice infrastructure, life shut down until we thawed. I think the only thing that kept me sane (a housebound beagle and two kids out of school were decidedly unhelpful in that mission) was the birdfeeder in the back yard. I’m dependent on Merlin Bird ID to tell me who my visitors are. This app, created by the Cornell Lab of Ornithology, offers a brilliant beginners’ guide to identifying local birds. American Goldfinch (Spinus tristis), showing his winter coat. His spring-and-summer one is much livelier. I keep my feeder filled with black oil sunflower seeds, which is what they want to seem to eat. These seeds pack protein and fat into a very small, easy-to-shell package. When the temperature plummets, birds need these extra calories to maintain energy and stay warm. And when berries and fallen seed may be encapsulated in ice, a full feeder can make a big difference in birds’ ability to survive. As the weather warms and more plants come into bloom, I will taper back on the feed to encourage them to scavenge insects from the garden. I hope that they’ll be enough in the habit of visiting my garden that they’ll stick around and enjoy the buffet. American Goldfinch, showing his distinctive wing markings. Dear winter, please get lost. Winter, I’m crying uncle. You win. I know I’m a winter wimp, that I can’t take the prolonged cold and gray. That’s why I moved from Chicago. It’s time for you to get packing, and please kindly take the rain with you. I haven’t been able to do a thing in the garden for weeks because it’s simply too wet to walk. Even taking the compost to the bin requires lacing up the winter boots. I sink to my ankles in the mud, which stinks, by the way. You sent two nice days yesterday and Saturday. Can we please, please have a bit more of the sunshine and warmth? Yellow crocus enjoying a rare bit of sunshine. I suppose if that’s too much to ask, I had better start boning up on my bog plant knowledge. Perhaps I can turn my home into a preserve for the endangered Venus flytraps and pitcher plants that are native to my home state. I suppose there are worse fates; these plants are fascinating. Yesterday I planted seeds of Papaver somniferum (Hungarian blue breadseed) and Papaver ‘Lauren’s Grape,’ as well as larkspur (Delphinium ajacis) ‘Apple Blossom’ and ‘Pink Queen.’ The breadseed poppy is perennial, but the others are annuals. Larkspur ‘Apple Blossom’ (Delphinium ajacis ‘Apple Blossom’). Photo by Baker Creek Heirloom Seeds. 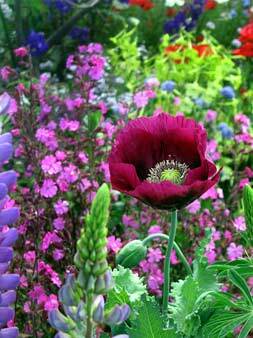 Papaver ‘Lauren’s Grape.’ Photo by Annie’s Annuals. Spread a layer of compost 1-2 inches deep over the area where you wish to plant. Smooth the compost with the back of a rake. Scatter the seeds over the compost. Use the head of the rake to tamp the seeds gently but firmly into the compost. Leave them alone. Don’t water; don’t cover. The seeds are tiny and need light to germinate. In the past, I didn’t plant them in compost, or sometimes I’d forget where I planted them and would mulch them over with shredded leaves. The ones I planted in November have germinated and their cotyledons hover just above the compost. They’re quite tough, having survived heavy rain and some wild temperature fluctuations so far. I also, against good advice, transplanted some crocuses just before they burst into bloom. Crocuses are tough; they’ll get over it. Some tasks you just have to tackle when you have the time. The garden could easily be mistaken for a mud-wrestling pit these days, thanks to frequent rains and plagues of squirrels that dig up my unfrozen ground to hide their found treasures. I wonder why the squirrels haven’t dug up the poppy seedlings (yet?). I’m not under 4 feet of snow at the moment, but that doesn’t mean I want to spend a lot of time in the garden right now. Nor should I: It’s terribly damp, and I will compact the soil where I walk and damage its structure where I dig. So to scratch the gardening itch, I turn to my houseplants. I am a terrible houseplant gardener. I never do anything as regularly as I should: I don’t water, I don’t turn my plants. I hope mainly to keep them on life support for a few months until it’s safe to take them outside again. That dry, centrally heated air that dries out your skin, hair, and eyes parches your houseplants, too. The air inside your home may have as low as 10% humidity, but plants (and humans) desire humidity of around 40%. Use a humidifier, or set plants on trays of pebbles filled with water (make sure the pots aren’t sitting in water). If you can, keep your plants with high humidity needs in the bathroom, where they can benefit from your steamy shower. Ferns like evenly moist soil, and succulents like it very dry. For most all other plants, wait to water until the soil is dry to the touch, down to the depth of your first knuckle. Don’t assume that your plant needs watering once a week. Most indoor gardeners overwater rather than underwater their plants. Letting the soil dry out between waterings cuts down on the prevalence of fungus gnats. When you do water, allow the water to saturate the soil and run through the bottom of the pot. Better yet, set the pot in a shallow pan of water for a short time. The dry soil will wick water up until the plant has what it needs. You’ll know it’s time to take the pot out of the water when the top of the soil looks moist, or when the container stops emitting air bubbles. Never let the pot sit in water longer than necessary. Most plants need a period of rest or dormancy in the winter months, when they’re not actively growing. Feeding encourages growth and robs your plants of a chance to recharge and get ready for the growing season ahead. Save the fertilizer until spring. Wide swings in temperature, such as a blast of cold air from an open door or a perpetually heated breeze from a vent, stress plants. Don’t forget that window glass can be quite cold. As you edge your plants to the window to grasp what light they can, be sure to keep the foliage from touching the glass. 5. Spin me right round. An additional tip from garden blogger and houseplant guru Lisa Steinkopf, is to give your plants a quarter-turn every time you water. You’ve observed plants growing towards their light source. Rotating the plant keeps it growing straight. Snowdrops (Galanthus sp.) blooming above their carpet of unraked leaves.